Lara at a clinic with Sabine Schut-Kerry. The year of 2012 brought about tremendous change, since we decided to change our lives for my Para Dressage riding. In January my husband and I started applying for jobs so that we could be closer to dressage trainers. 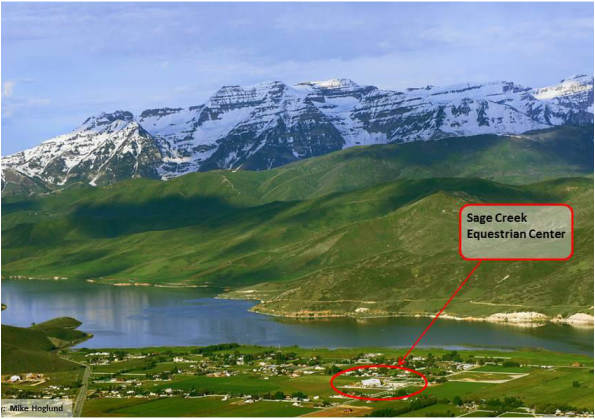 In February, I started dressage training with Annie Sweet at the Sage Creek Equestrian Center in Heber City, Utah. In March we went to the Dressage Affaire in Del Mar, California to observe my first Para Dressage qualifying show. While there, I was examined by the FEI (Fédération Equestre Internationale) delegates and classified as a Grade III rider. Para Equestrians need to be classified by the level of their impairment. Riders are ranked into Grades, which have been created to allow riders with the same abilities to challenge each other. 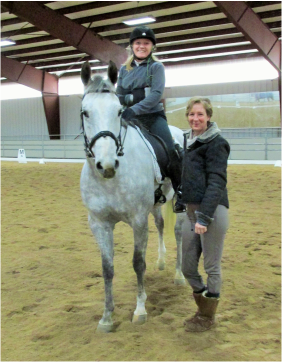 The Para Equestrian training camp was in April 2012, and I spent a week in Maine training with some of the best Para riders in the country. In June I started a new job with the U.S. Forest Service in Salt Lake City, and moved to Utah. In July and August, I showed at a couple schooling shows on an NAC horse, and at one United States Equestrian Federation recognized dressage show on a horse I borrowed from a very generous family. At the same time, we bought a house with a barn on a couple acres in Heber City, moved our household, and sold our place in Wyoming. In October, we bought a sensitive, but sensible horse named Slate, who is a natural at dressage with a one-handed rider. When my husband got a new job near mine in November, the transformation was complete. After all that, no one can doubt our commitment to Para Dressage!